The Nangarhar Public Health Directorate said a three-day polio vaccine campaign has been launched in the province and about seven hundred thousand children under the age of five will be inoculated. Health director of Nangarhar says about 20,000 children will not be vaccinated due to insurgent’s threats in four districts of the province. “Unfortunately, polio cases have increased compared to the last year and one case has been registered in Nuristan province, because the eastern zone is under threat and the virus transfers from Pakistan to different parts of the country,” said Najibullah Kanawal Nangarhar’s public health director. Meanwhile, religious scholars called on insurgent groups to cooperate with this campaign. “Vaccines are very important for the heath of children and I call on parents and religious scholars to campaign and increase public awareness and let their children receive vaccines and let’s put an end to this phenomenon,” said Gul Nabi a religious scholar. Ali Mohammad is 26 years old and was left paralyzed 22 years ago after contracting polio. He had not been vaccinated against it. Mohammad called on the people and families to get their children vaccinated. “When I was in Pakistan as a migrant and the government could not distribute vaccines to all migrants and I did not receive the vaccine and I become paralyzed and now I ask the parents to save their children’s life by giving them the vaccine,” Mohammad said. Polio is a non-curable disease that can only be prevented through the vaccine. The Ministry of Public Health says Afghanistan and Pakistan are the only countries where the disease has not been eradicated so far. 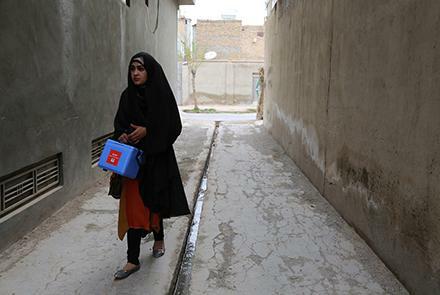 At the same time the polio campaign also started in Zabul province. Local officials said that during their five day campaign about 150,000 children under five years old will be vaccinated.